One of our all-time favorite breakfast recipes came from a magazine that a dear friend passed on to me for my enjoyment. The basic recipe was for Ham & Cheese Egg Cups. Of course, I have made my own adaptation and here it is. Press a slice of ham into each muffin cup. Place spinach into each cup on top of the ham. Add in some cheese to each cup on top of the spinach. Crack an egg on top of each cup and season with greek seasoning, salt and pepper. Bake for 15-20 minutes or until done to what you prefer for eggs! (I like the yolks to be just a little soft!) 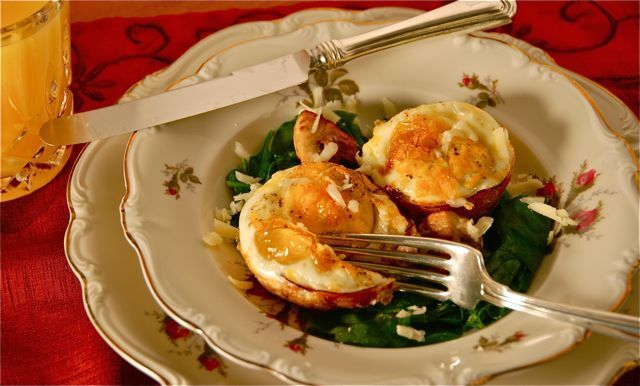 Remove ham egg cups from muffin tin and serve on a plate sprinkled with fresh herbs or chopped spinach & shredded cheese. YUM! When I serve this recipe here at the Inn, I make a Cheddar Cream Sauce to drizzle on the plate and over the cups right before I serve them. Depending on the season, I will omit the spinach and use other ingredients. At times, I have sauteed the spinach and served it as shown in the picture above. The cups are also delicious served over roasted tomato slices fresh from the garden in the summer and topped with fresh basil. It's just one of those great, versatile recipes that comes out perfectly delicious every time! This recipe looks extremely delicious. I have never thought of using a muffin pan for a unique breakfast like this; I will definitely have to try it.